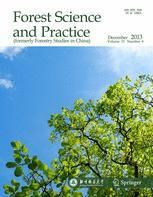 Forest Science and Practice (formerly Forestry Studies in China), is an international journal of forestry sci­ence sponsored by Beijing Forestry University. The Journal intents to publish primarily peer-reviewed original articles, reviews and short communications produced by authors across the world, covering the full spectrum of subjects in forest research, such as forest ecology, silviculture, forest management, forest tree breeding, tree physiology, forest pest and disease control, forest resource information management, forestry economics and management. Articles on related subjects, such as soil and water conservation, wood science and technology, and forest products processing, are also offered. The journal encourages academic exchange between scientists in different fields who share a common interest in forestry research, and bridges the gap between researchers in these fields, in China and abroad.